These stunning oval shape earrings are a really great way to make a traditional statement with the gold plates that they were naturally crafted with. 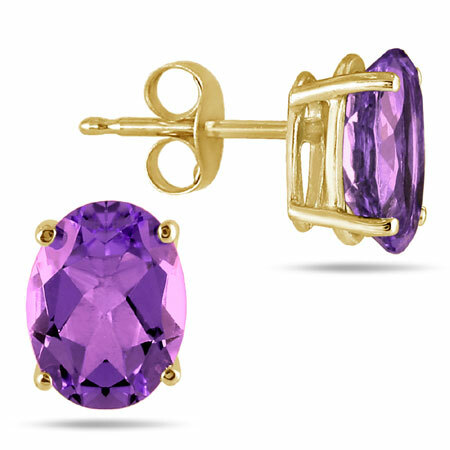 This wonderful Amethyst stud is a beautiful purple color, combined with the 14K Yellow Gold to give the jewelry a really well way to stand out and make a bold fashion statement that was sent in prior years. The possibilities with these Amethyst birth stones are virtually endless. You can combine this color with any outfit, fancy or casual, and still look like the hottest person in the room! These will definitely be the talk amongst all of your fellow friends! These earrings are placed on with push backs, which are great enablers to make sure your fine pieces of jewelry will remain in place for the duration that you are wearing them for. These will also prevent pinching and any uncomfortable feelings that can be given off when wearing any traditional settings of earrings. We guarantee our 6x4mm Oval Amethyst Stud Earrings Set in 14K Yellow Gold to be high quality, authentic jewelry, as described above.